The Mill and the Cross. I may like the painting better than the movie. But I like the movie because it gives us cause to consider the painting. Which makes me consider that procession and mesh of life and intervening forces in which we’re embedded as we fulfill that life into which we’ve been born, or trace that road which we’ve chosen. I wonder with whom of all those 500 characters in the procession we each choose to align. Are we the miller, the horseman, the weeping mother, the man shouldering the fallen tree? 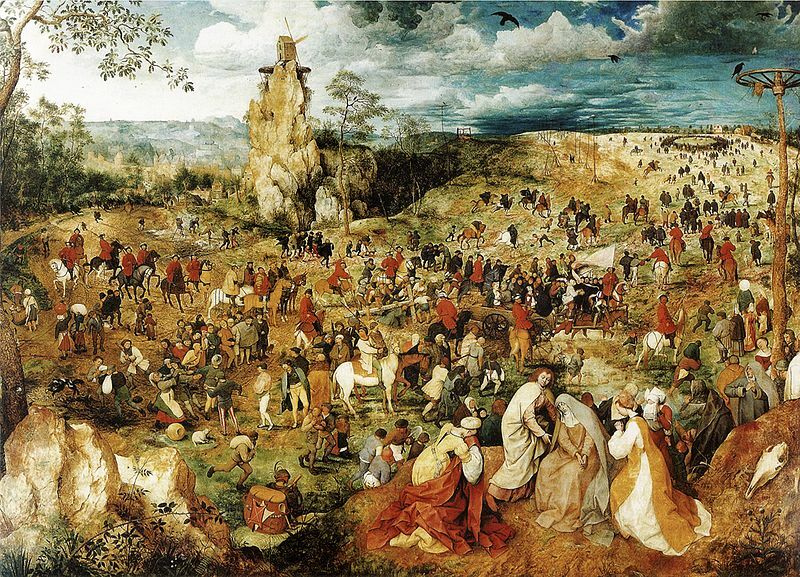 And I found it pleasant to be thrust into the stillness of Brueghel time. Especially after a harrowing day of travel to arrive in this harrowing city. I want that stillness, that repose from which to witness that tragedy we call being human. This morning I feel disconnected in this most connected city. I wonder a little about what the hell I’m doing here. I decide that I will just move through the day and try to be kind. That’s all I will do today. Just be kind. I’ve kind of failed at it. But I’m still trying. I have eight more hours to go. And again tomorrow. Perhaps I will try. This entry was posted in Uncategorized and tagged Mill and the Cross, san francisco, SFIFF, travel by Andrew Lewis. Bookmark the permalink.